We can vouch for the fact that this is completely true. We’ve seen it for ourselves – Scotmid is a real co-operative that upholds the values of the original Rochdale pioneers. 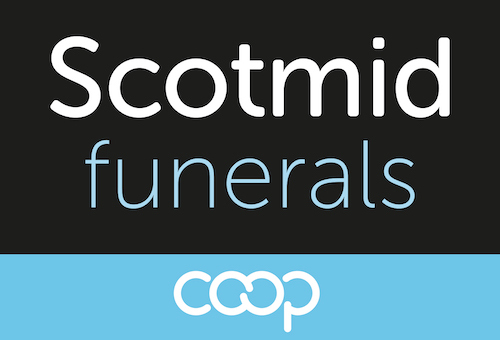 It is not to be confused with the Manchester based Co-operative Funeralcare, the English co-op that has recently started opening branches in and around Edinburgh, a business that falls far short of the standards exemplified by Scotmid. Unfortunately, for the public, and particularly for people who have been bereaved, the huge differences between Scotmid and the English Co-operative Funeralcare may not be immediately obvious. Scotmid is an Edinburgh-based members’ co-operative society formed by the amalgamation in 1981 of the Dalziel Society of Motherwell and the St. Cuthbert’s Co-operative Society (founded 1859). In 1999 Scotmid merged with the Prestonpans Co-operative Society. As a co-op, Scotmid is pledged to uphold values of honesty, openness, social responsibility and caring for others. It is a social enterprise model which is particularly appropriate to the provision of funerals. Scotmid owns 16 funeral parlours. Eight of them are in Edinburgh. The remainder are in Broxburn, East Kilbride, Hamilton, Leith, Livingston, Motherwell, Penicuik and Uddingston. The branch in Broxburn trades under its old name of Thomas Brown, and the branch in Motherwell trades under its old name of Dundas Fyfe. All the rest trade under the name of Scotmid. For contact details of each branch see the Scotmid website. We have spent days visiting every branch, talking to staff, testing customer service and, to the best of our ability, assuring ourselves that people who have died are cared for here with the greatest respect, dignity and privacy. What we found astonished and delighted us. Scotmid’s funeral parlours are among the very best in Britain. Most of the branches are wheelchair accessible and several have disabled toilets. The Scotmid vehicles are new Mercedes, and the ceremonial cortege at funerals is now superb. They have recently acquired the most beautiful vintage style hearse, the only one in Scotland, which can be seen on their website – if you’d like this for your funeral just ask, there’s no extra charge. Two of the parlours, Dundas Fyfe and Thomas Brown, have spacious halls in which you can hold your funeral service if you wish. Many families do this at Dundas Fyfe in Motherwell. In Broxburn, attendance has dropped off since they opened the beautiful new crematorium at West Lothian. At Dundas Fyfe and Thomas Brown, people who have died are cared for on the premises. At all the other branches they are cared for at Forrester Park, where they are made ready for their funeral before going back to the branch where you made the funeral arrangements so that you can come in and visit them — if you wish. Forrester Park is a busy place, very well-equipped, and standards of care are very high indeed. If they hadn’t been, we would have left and gone home there and then. Excellent as its premises may be, the glory of Scotmid is its people. They are all highly professional and well-trained, of course, but above all they are exceptionally nice. Although they are members of a biggish company, they do not behave in a corporate way. They comprise a great range of characters and are very much themselves. Even though they work in scattered premises they all know each other very well. They are good friends, they support each other and they work together as a great team. Often, an organisation of this size will be somewhat characterless, but not Scotmid. They are all individuals, different characters united by a strong sense of purpose and shared values. They are all there to care for you and for the person who has died to the best of their ability. (If you do not completely click with the first staff member you go to see, it would be worth your while trying a different branch. You will be sure to find someone you relate to). The people in the branches are called funeral arrangers. Mostly they run the branches themselves, and have added their personality to their branch with little individual touches. This is encouraged by James and his managers, who trust their staff completely. There is a friendly rivalry between the branches when it comes to window displays at Christmas time, and plans start early each year to come up with a design that will be voted the best in the company. Scotmid also have a number of ‘Rovers’ – staff members who will look after branches to cover for sickness or holidays, or while arrangers are away for training. It is unlikely that the arranger with whom you arrange your funeral will be the same person who also leads it on the day. 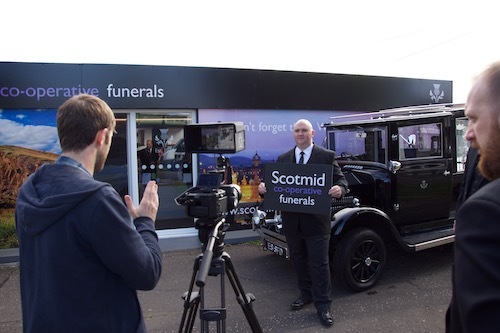 The Scotmid way is to have funeral conductors or funeral directors look after the funeral on the day. You will be introduced to this person in good time, they will call you and go through all the arrangements with you beforehand to make sure that everything is in order, but we nevertheless feel that this is a little disappointing. We would rather your arranger was there for you. If it’s a traditional, ceremonial funeral you want, Scotmid will conduct it as well and as splendidly as anyone. They are impeccably smart and have the experience and quiet competence to ensure that everything is done perfectly. If you favour a less formal funeral, speak to your arranger and find out what the options are. No problem at all. The focus will always be on working with you to create the funeral that matches your wishes and values, together with those of your family and the person who has died. Scotmid’s staff believe that every funeral is unique. You can expect them to listen to you first and foremost, to inform and guide you if you need them to, and then to be governed by your decisions. The firm has recently enhanced its training programme for staff to ensure that you are given the best personal service possible, and new staff spend 13 weeks learning every aspect of the business before they are considered ready to look after families themselves. The company goes to great lengths to recruit only the best personnel, and Chris and Darren, the funeral managers, spend a huge amount of time ensuring that only the best applicants are considered. This doesn’t mean that they have a specific template in mind though – many of the staff at Scotmid have come from vastly different backgrounds – banking, retail, catering, local authority, social care, the DWP, the British army, CID – they all bring different skills and abilities that enhance the whole. As James Blackburn, Head of Funerals says “You can train anybody how to arrange or carry out a funeral, but you can’t train someone in having that special spark, that empathy and ability to understand what each family needs.” The rigorous selection and interview process is designed to find these extra special individuals among the many hundreds of applicants for vacancies when they arise. The outstanding asset of Scotmid is, as we have already said, its people. They’ll go the extra mile for you. And then further. Scotmid takes its responsibility to deal fairly and openly with the people of its community very seriously indeed, and never forgets that it is owned by its members. 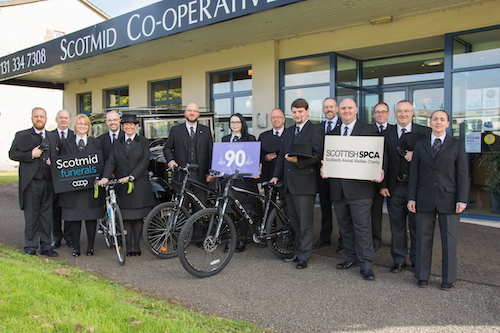 All good funeral directors take their social responsibility to their community seriously, but Scotmid, as a community co-operative, is in an especially good position to do that. Your wellbeing matters to them. Just one feature of this is the way they publish their prices on their website. Most funeral homes don’t. The arranger in your local branch will almost certainly be someone who lives in the community nearby. While we were visiting we noticed children waving to the staff as they went by, and it’s normal for friends and family members to stop in during the day if they’re passing. It’s clear that the Scotmid branches are very much part of each town and village where they are located. And there are other, deeply important, small things that matter to the Scotmid people which makes them stand out to us from other companies. There is always a light left on every night in every branch, but if there is someone in the chapel of rest overnight then they will have a lamp lit for them. Passers by won’t notice, but the family will know that their relative hasn’t been left in the dark. That’s important. And thoughtful. Your first call will be answered, during office hours, by the person in the branch you have chosen. If you ring at night, your call will be answered by the duty funeral director at his or her home. Simple Funeral – £1590 exclusive of third-party costs. • Home Visits – Very happy to make arrangements with you either at the funeral home or at your own home. • Embalming – If you wish to visit the person who has died at the funeral parlour, you may be advised to have them embalmed. This will only be with your permission, and they will discuss it with you sensitively. • Ethnic Specialism – The staff are all trained and experienced in arranging funerals for people of different faiths and funeral traditions. • Home arranged funerals – If you would like the person who has died to stay at home until the say of the funeral, they will willingly work with you to achieve this. • Website – Lots of useful information well set out. All prices shown. • Money matters – Very fairly priced for what we reckon to be a high-value service. All their prices are published on the website, so you’ll know exactly where you stand before you go to see them. One indicator of value is the prices of their coffins, which are very low. They will work to your budget and absolutely not try to upsell you. If money is any sort of a problem, be completely upfront about it and they will help you find a way. Parking – Off-road parking available at Dundas Fyfe and Thomas Brown. For other branches, have a look at the website or ring and find out. Scotmid has come a long way in the last few years under the gentle but very effective leadership of its excellent Head of Funerals, James Blackburn. We have every confidence that it’s going to go on getting better still as additional branches are opened in new areas. The foundations on which it is built are very solid indeed. The staff are looked after, and in turn they will look after you. We admire Scotmid. Above all, we have a very strong affection for it because everyone who works for it is just so likeable. Here is a community co-op doing exactly what co-ops were founded to do: improve the wellbeing of people from all walks of life. having worked closely with james blackburn at dignity plc and experianced not only his dedication, drive and ability to look forward plus his personel support and help to myself it is no surprise that he should excel in his present position. Hello,I would just like to thank you for your kindness to my family on the recent loss of my mum,Lily.My dad and everyone were so pleased with the attention to every détail.It made a very sad time for us so very much easier.My mum would loved to have met you all. (in different circumstances)she would have a laugh at that.Thank you for taking care of her.She was a very special lady and loved by all who met her.We all miss her.Sandra.